Once a familiar landmark on the east shore of Lake Sammamish, this house was built by Thomas and Caroline Alexander in 1902 on land which was known for most of the century as Alexander’s Resort. Thomas Alexander had earlier been the “walking boss” (traveling construction supervisor) for the Seattle, Lakeshore and Eastern Railway. 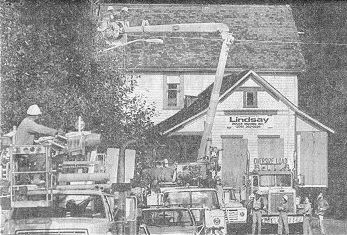 In 1986, when the property was threatened by plans for a housing development (today’s Eagle Ridge), Issaquah Historical Society volunteers, led by Greg Spranger, worked to save the house. Property owner Puget Power donated the house and assisted in the move to a temporary location. 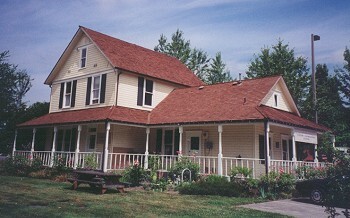 The house was later moved to its current location, and restoration by local volunteers was completed in 1989, creating the new headquarters for the Issaquah Chamber of Commerce, and the Issaquah Visitors Center. By 2000, the Chamber of Commerce was cramped for space in this 1,500 square foot house. The City of Issaquah and the Chamber retained the Swanson Architectural Group to design a new wing that would approximately double the square footage of the building while preserving its Victorian character. The Visitors Center features brochures and information about activities, recreation, entertainment and shopping in Issaquah and around the region. The center also provides information about lodging, restaurants, realtor listings, and services such as schools and daycares. Utility crews clear the way as the Thomas Alexander farmhouse moves south on East Lake Sammamish Parkway Southeast.